WASHINGTON – Retired Army Maj. Gen. Patrick Brady, recipient of the U.S. military’s highest decoration, the Medal of Honor, as well as other top retired officers, say President Obama’s agenda is decimating the morale of the U.S. ranks to the point members no longer feel prepared to fight or have the desire to win. “They are purging everyone, and if you want to keep your job, just keep your mouth shut,” one source told WND. Retired Army Lt. Gen. William G. “Jerry” Boykin, who was with Delta Force and later Deputy Under Secretary of Defense for Intelligence under President George W. Bush, says it is worrying that four-star generals are being retired at the rate that has occurred under Obama. Boykin points out that the military adheres to the constitutional requirement of a civilian leadership over the military. As a consequence, officers are not allowed to criticize their civilian leadership, as occurred when Gen. Stanley A. McChrystal was relieved in 2010 of his command of the International Security Assistance Force and commander of U.S. Forces in Afghanistan. He was relieved due to what has been described as unflattering remarks made about Vice President Joe Biden and other administration officials in a Rolling Stone magazine article. 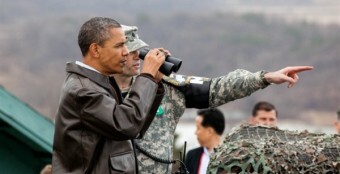 He was recalled to Washington where Obama accepted his resignation as commander in Afghanistan. Some officers were involved in adulterous affairs and those situations, Boykin said, also were grounds for dismissal. Boykin specifically said that because of the civilian-military relationship, he did not see any prospect for a “coup” coming from the military ranks. Nevertheless, Boykin said the future of the military is becoming more and more of concern, since colonels who would be generals also are being relieved of duty, if they show that they’re not going to support Obama’s agenda, which critics have described as socialist. Boykin referred to recent reports that Obama has purged some 197 officers in the past five years. These reports suggest these officers were suspected of disloyalty or disagreed with the Obama administration on policy or force-structure issues. As Boykin pointed out, a number of them have been relieved of duty for no given reason. “Morale is at an unprecedented low,” Boykin said, part of which is due to sequestration. Sequestration has seriously cut back operational readiness for the military to the point where Boykin said that often they have no ammunition and are unable to conduct training because of the planned cuts. “These officers want to train for war but are not be allowed to” because of the preoccupation not only with sequestration, but what Boykin said were other concerns surfacing in the military under Obama as commander-in-chief. Brady, who was a legendary “Dust Off” air ambulance pilot in Vietnam and detailed his experiences in his book, “Dead Men Flying: Victory in Viet Nam,” said, “The problem is military people will seldom, while on duty, go on the record over such issues, and many will not ever, no matter how true. “I hear from many off the record who are upset with the current military leadership and some are leaving and have left in the past,” he said. Obama has insisted there were no reinforcements available that night. But Ham contends reinforcements could have been sent in time, and he said he never was given a stand-down order. However, others contend that he was given the order but defied it. He ultimately was relieved of his command and retired. Now, new information in the Washington Times reveals there were Delta Force personnel in Tripoli at the time of the attack and two members volunteered to be dispatched to Benghazi to assist in protecting the Benghazi compound, contrary to stand-down orders from the State Department. “To understand the insufferable assaults on our military and veterans, who should be exempt from political squabbles but are often at the forefront of Obama threats, we need to understand the psyche of the elite in this country led by Obama,” Brady said. “We cannot survive without increasing patriotism, a youth schooled in the Constitution,” Brady said. “If the uncommon common American is to prevail against the elite, we need to return to the truths of our Constitution. Army Major Gen. Paul E. Vallely similarly has been very vocal in his opposition to the Obama administration.